New analysis by the McPin Foundation shows that the Government’s commitment to create a “culture of innovation and research that is embedded at every level” in the NHS is far from being met in mental health services. Stronger national leadership and incentives are needed to support mental health trusts to invest in research. The Government has committed to creating an NHS “workforce that embraces research and innovation” and to tell every person using health services of opportunities to participate in research. 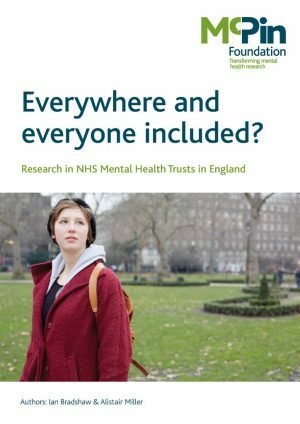 Making this a reality in mental health requires research activity to be spread across all the 55 NHS trusts in England that provide specialist mental health services and train mental health professionals. There is a postcode lottery for people using mental health service to access the new treatments and other benefits participating in research brings. Only 2% were involved in NHS funded mental health studies in 2014/15 compared to the almost 20% of cancer patients who participated in research. Many trainee psychiatrists and other mental health professionals miss out on vital opportunities to learn about research and evidence based medicine. Many researchers continue to struggle to recruit people to take part in the limited number of mental health studies that are being funded. Without better treatments developed through research and health professionals trained in using evidence the NHS will continue to struggle with the twin challenges of growing demand for mental health services and falling funding. That requires all parts of the system to contribute fully to research. If the Government wants to make a reality of its commitment to patients it needs to provide leadership in its forthcoming strategy on mental health research. It should incentivise collaboration between existing centres of excellence and those trusts wanting to build research programmes. It needs to work with charities and professional bodies to build excitement about the potential of research with people using mental health services and mental health professionals so more volunteer to take part.